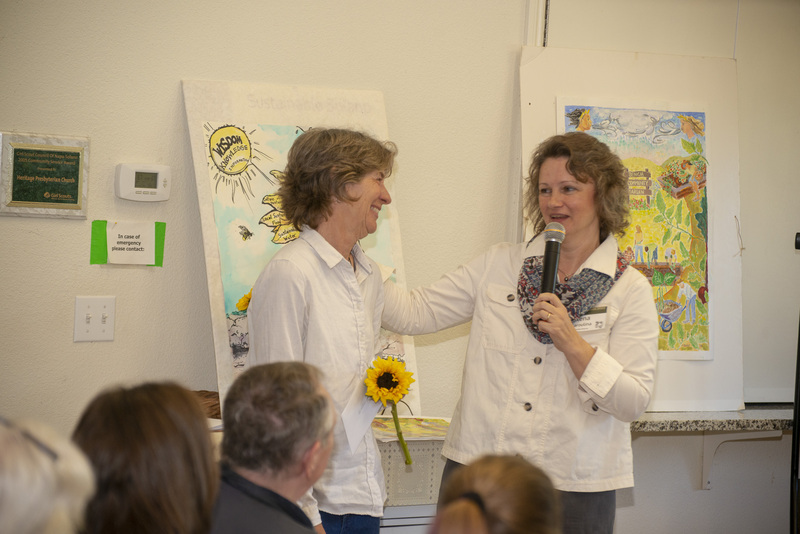 It’s been 20 years since the organization that would become Sustainable Solano put down roots through the creation of the first community garden in Benicia, and on Saturday, we recognized the most important element in making that happen: the people. More than 50 people gathered at Harvest Presbyterian Church, the place where so many seeds of Sustainable Solano’s growth have been planted, to celebrate their involvement with the organization. 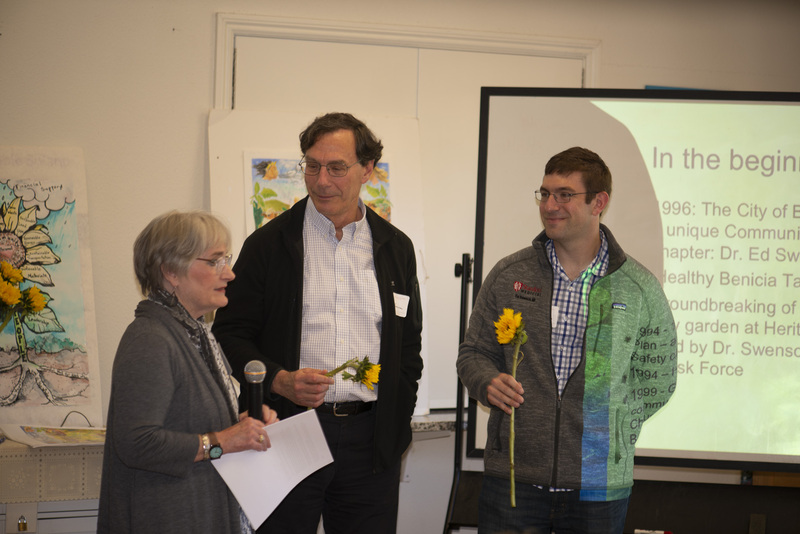 Special guests Dr. Erik Swenson and his son, Kai, attended in honor of Dr. Ed Swenson, the force behind the creation of Benicia Community Gardens, starting with the garden at Heritage Presbyterian that now bears his name. Board Chairwoman Marilyn Bardet spoke about the years of work that led to the 1999 groundbreaking of the intergenerational community garden at the church led by Dr. Ed Swenson and the Healthy Benicia Task Force as a way to encourage healthy food and community sustainability. She talked about incorporating that vision into the Benicia General Plan, which created a public-private partnership around the endeavor. An important part of the celebration was to recognize the many volunteers, community partners, past board members and advocates who have helped to shape Sustainable Solano and given it the strong foundation needed to grow and flourish over the past 20 years. “We’ve been very fortunate in the kinds of help we’ve received and the types of responses we’ve gotten,” Marilyn said. 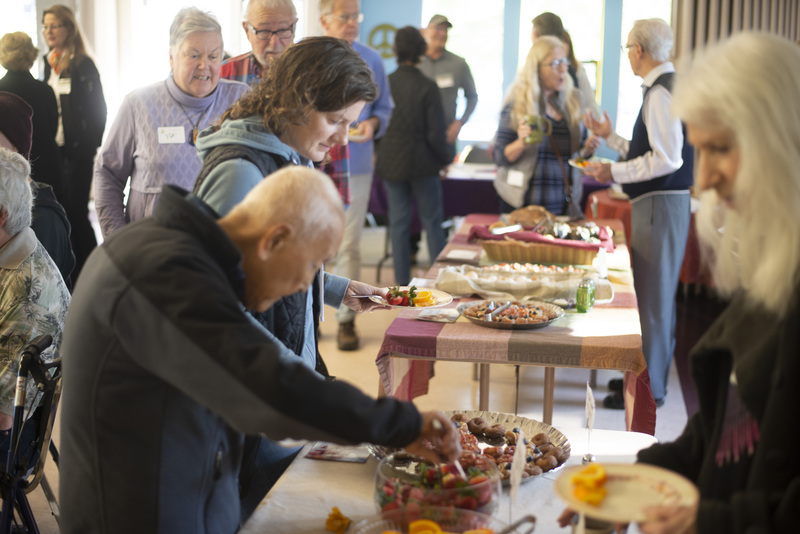 Bits of history adorned the walls as participants nibbled on breakfast items from local shops and farms and discussed their roles with Sustainable Solano over the years. A slideshow traced the progression from Benicia Community Gardens through the creation of the orchard, numerous sustainable backyard food forest gardens and more. As Sustainable Solano grew, it maintained its vision around local food, extending that concept from intergenerational gardening to community food access. This manifested into new programs: the CSA program; the Benicia Community Orchard, also at Heritage Presbyterian; and, with new attention to the tenets of permaculture, Benicia Sustainable Backyard. Through such programs, the seeds were planted for the growth of programs in Benicia and throughout the county, Executive Director Elena Karoulina said, once again focusing on the people who made such things possible, including those volunteers who helped launch the programs and later made their way onto the organization’s advisory boards and board. She also discussed designers who have helped grow the reach of permaculture, such as David Mudge, who launched Benicia Sustainable Backyard, and Kathleen Huffman, who went through permaculture design training and then became the designer and contractor for Solano Sustainable Backyard that brought the concept to other cities in the county. The program now has 19 gardens and counting, has 1.2 million gallons of annual positive water impact, and thousands of people have been educated through the hands-on installation workshops. Kathleen is leaving in July to return to Oklahoma, where she plans to foster similar permaculture programs. “Our Benicia seeds are going nationwide,” Elena said. Seven new designers will undergo training in the coming months to take on Kathleen’s role here at home. The celebration ended with a look toward the future as Sustainable Solano continues in its mission of “Nurturing Initiatives for the Good of the Whole.” Elena talked about how the organization continues to grow and add new programs that expand that mission in Benicia and around the county, such as the Urban Forest and Solano Gardens programs, Resilient Neighborhoods and the Local Food System program. And how new generations will gain valuable skills through planned high-school and workforce training programs, including the Community Land & Water Caretaker Program planned for Benicia. Saturday’s celebration was the first of several we plan around the county this year. Following this recognition of our roots, we plan to celebrate in the coming months the stem of growth throughout the county, the flower and seeds that are spreading far and wide. We hope you can be a part of these upcoming events as we honor the importance of the people who have shaped Sustainable Solano through the years and are moving us forward.